Treading water may be one of the healthiest forms of exercise. Since you're floating gently in water, there's no harsh impact on your joints and no strain on your back or neck. Despite how placid you might feel while treading water, it's still a great form of exercise. Treading water can burn 200 to more than 600 calories per hour, depending on the intensity, and engages muscles all over your body if you take the time to perfect your treading technique. Swimming is uniquely healthy for your joints, muscles and bones because there's no impact involved in almost any swimming exercise. If you've struggled with working out because of the physical strain some exercises place on your body, treading water at the pool can be a delightful alternative, especially for older individuals or those struggling with a healing injury. Additionally, acute injuries common in other sports – sprains, fractures and dislocations, for example – are very rare in swimming. Swimmer's shoulder, which is an inflammation of the tendons of the shoulder that is often caused by the repetitive overhead arm motion, may be of greatest concern as far as injuries go. Don't let treading water's no-impact, no-injury workout fool you: Since treading involves training your muscles against constant resistance, you'll be engaging the muscles in your arms, legs, core and just about everywhere else. One hour of treading water can burn up to 660 calories, depending on the level of exertion. When compared with other exercises, this is equivalent to over two hours of walking or an hour cycling, making it a very efficient way to meet your daily calorie-burning goal. Everyone's metabolism, diet and exercise level is unique, so calorie estimates may be lower or higher depending on your body's physiology. If you're a new swimmer, treading water is a great way to start getting comfortable in the pool. 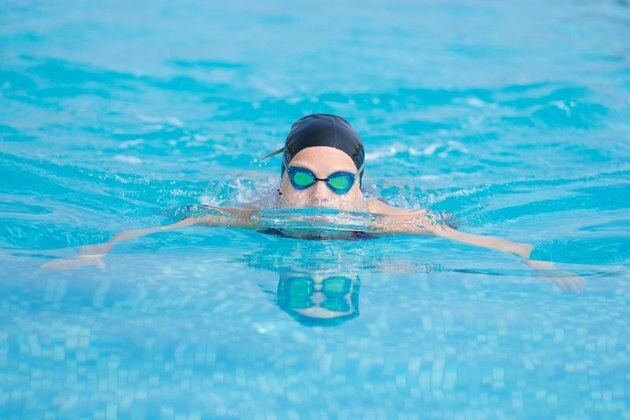 If you're confident treading water for longer stretches of time, you might consider working other swim strokes into your workout, which will engage new muscles and help you burn even more calories. Vigorous treading can burn over 600 calories per hour, compared to moderate treading's 200 calories, but a stroke such as the butterfly can burn almost 700 calories per hour. Swimming may be safe for your muscles, but it's important to consider your comfort and skill levels any time you step into a pool. Make sure your local swim spot has a lifeguard on duty whenever you're exercising, and only swim in a depth you're confident in. Individuals with knee issues should be aware of their personal limits getting into and out of the pool using a ladder. Finally, tread water in a spot where you can still touch the bottom if you need to for added security and comfort. Treading water is important to learn at an early age, as drowning is the No. 1 cause of unintentional death for children ages 1 to 4 in the United States, according to the CDC.